The spring woven fabric hat has 4 unstructured panels including 2 mesh on the sides. It incorporates a pre-curved peak and the size is adjustable with the fabric strap and buckle. 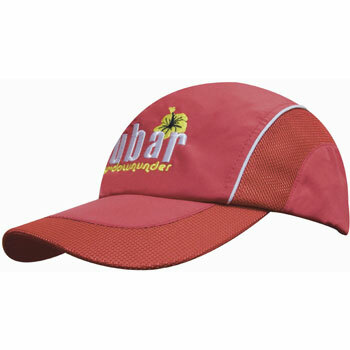 This cap would enhance any companys corporate work wear and would be an excellent gift for any event. Please contact us directly for printing options. Colour combinations (Main Colour and Beading): Pink & White, Navy & White, Pink & Pink, Red & White, Royal Blue & White, White & Navy.